Read more at royalgazette.com. 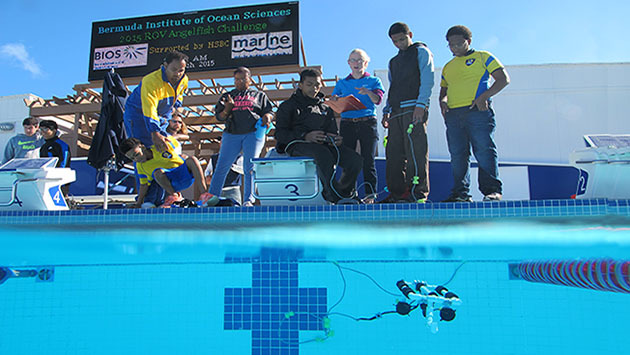 A new level of competition has been added to the 2017 MATE Bermuda Regional Remotely Operated Vehicle Challenge. The school event, which will be held at the National Sports Centre on Saturday, will feature the ranger class for the first time. “This is the first year we run the ranger class for Bermuda and it is a high level of competition,” Bermuda Institute of Ocean Sciences science educator Kaitlin Baird, who co-ordinates the programme, said. Twenty-five teams from 12 Bermuda schools and educational organisations are set to take part in the challenge, which teaches young people about the world’s oceans, and the importance of preserving them. They will set the robotic vehicles they have built in collaboration with instructors on a variety of missions. Students will also earn points from judges based on a marketing poster and team interviews about their ROV.